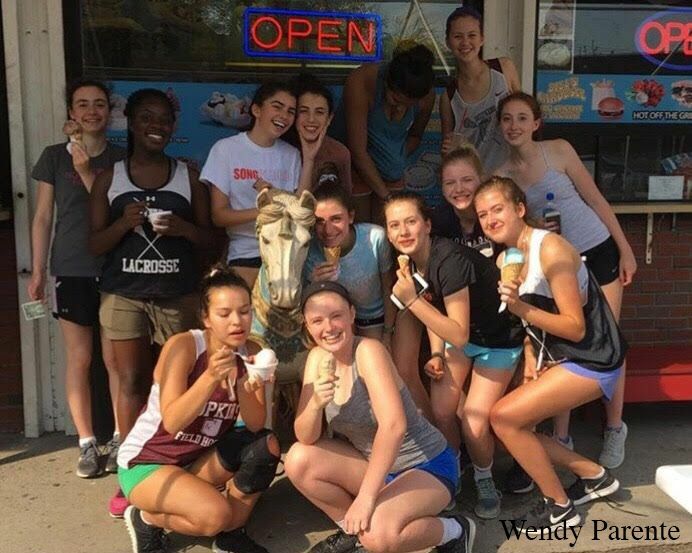 The Girls Junior Varsity Lacrosse team runs to Bill’s Carousel Ice Cream for a treat after a tough week of games. Hopkins Students Scream for Ice Cream! Summer vacation is here, along with all of the activities and traditions that go with it. One such ritual is going out for ice-cream. Many students have a favorite local ice-cream shop to visit when the temperatures get high, but if you do not know where to go, or are just looking for some new places to try, here are some recommendations from Hopkins students. Ashley’s Ice Cream is a favorite of many students. Ashley’s makes its own products and uses ingredients from local farms, such as Bishop’s Orchards in Guilford. The stores are located in New Haven, Hamden, Branford, Guilford, and Madison, convenient locations for many students. This is the case for Mary Halvorson ’21, who frequents the franchise because “it’s very close to my house, and it’s also a fundraising place, so that’s a plus.” Phillip Delise ’20 also appreciated its location, “I like it because it’s a nice treat after whatever you’re doing in New Haven, and it’s convenient.” They suggest trying cookie dough, coffee, or cookies and cream. front gives the shop its name and is a popular spot for taking pictures. explained, “They give you the most gelato possible in the smallest cup. It’s perfect.” Their gelato is handmade in the store in small batches. Collier recommends the creme brulee favor. These locations are only a few of the many ice-cream shops in Connecticut for hot summer days and any other time of the year. The accessible shops are rarely more than a short drive away and are pleasant summer afternoon destinations to visit alone, with family, or with friends you have not seen since the end of school. Each one has a unique fare, but all will provide a satisfying ice-cream experience.